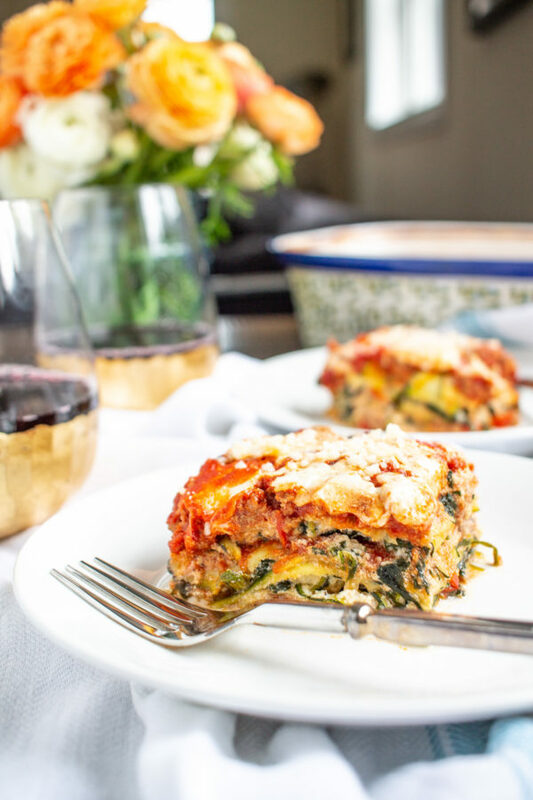 A bold meaty zucchini lasagna made with thin slices of zucchini instead of pasta. 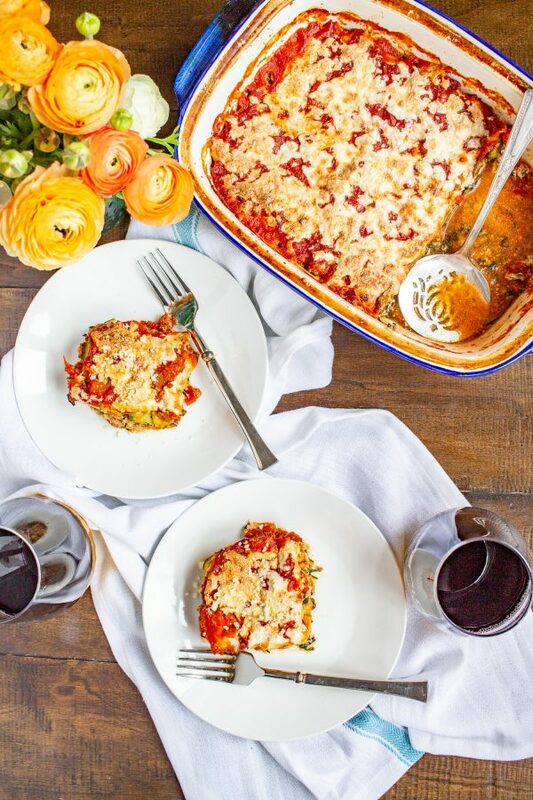 This zucchini lasagna recipe is a lower carb version of a classic! 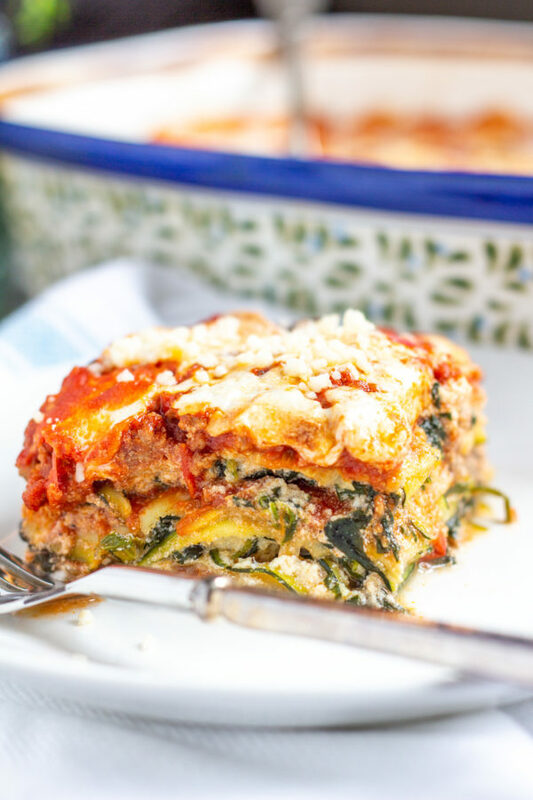 I love this Zucchini Lasagna recipe because it manages to be meaty while being low-carb. 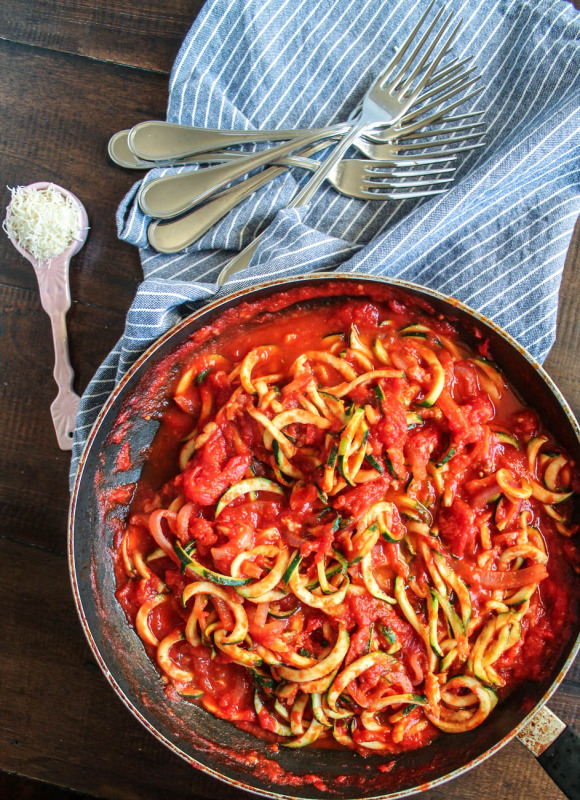 Thin strips of zucchini replace pasta in this healthier version of the classic Italian meal. 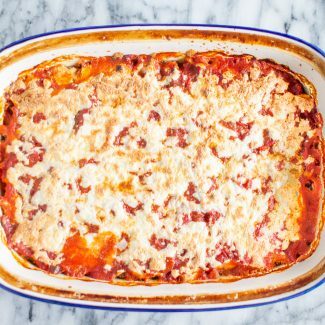 The beefy bolognese sauce brings this zucchini lasagna to life, and you won’t even miss the pasta. This recipe comes together in under an hour, with just 20 minutes of preparation time, and it feeds six. 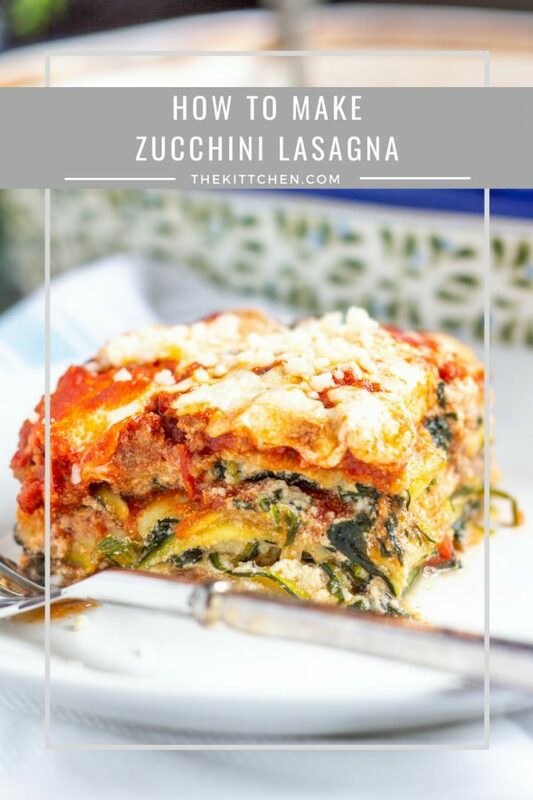 If you truly love pasta and can’t give it up, you could half the amount of zucchini and add both lasagna noodles and slices of zucchini to this recipe. 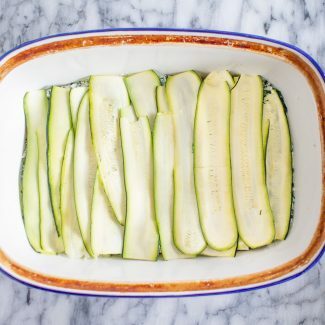 While zucchini has a different consistency than pasta, the al dente baked zucchini is a substitute I am happy to make. More veggies, less carbs, I think it is a win. The trick to getting this recipe to work is to slice the zucchini really really thin. I used a potato peeler to create super thin slices. I think it works better than a mandoline. Hand slicing won’t work. 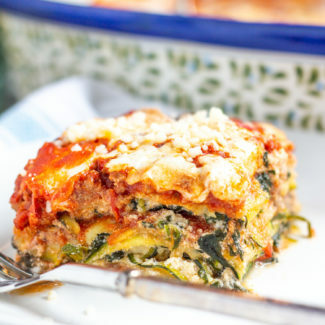 Zucchini contains a lot of moisture, and if the zucchini is too thick your lasagna will become a little soupy. 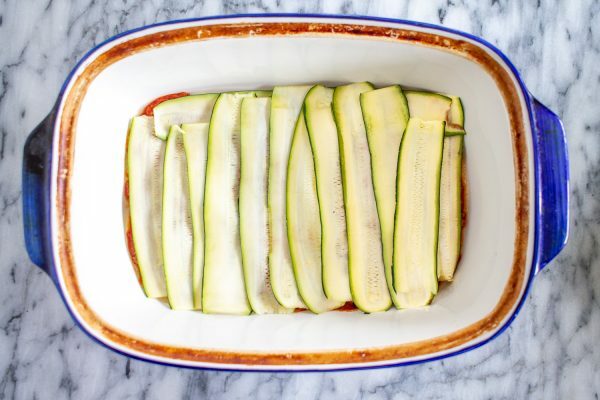 Remedy this by making super thin slices of zucchini, and or placing the zucchini the oven for a few minutes to dry out. 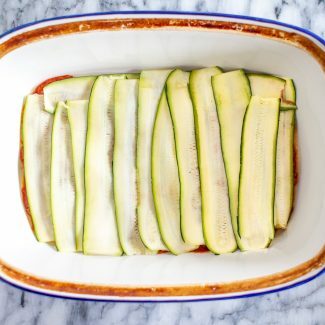 If you want to use the oven method, heat your oven to 350, lay the zucchini out in a single layer on a baking sheet, dust with salt, and bake for 5 minutes. 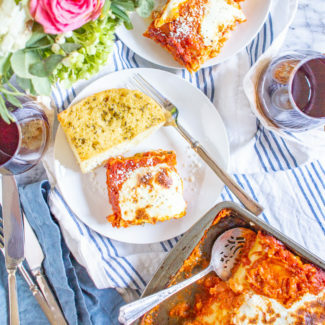 Blot the zucchini with paper towels and then assemble the lasagna. 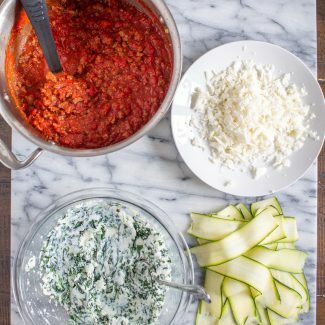 Or you can opt to slice the zucchini first, place them on paper towels, blot them, and then let the strips dry out while you prepare the bolognese sauce. I like to use this method. 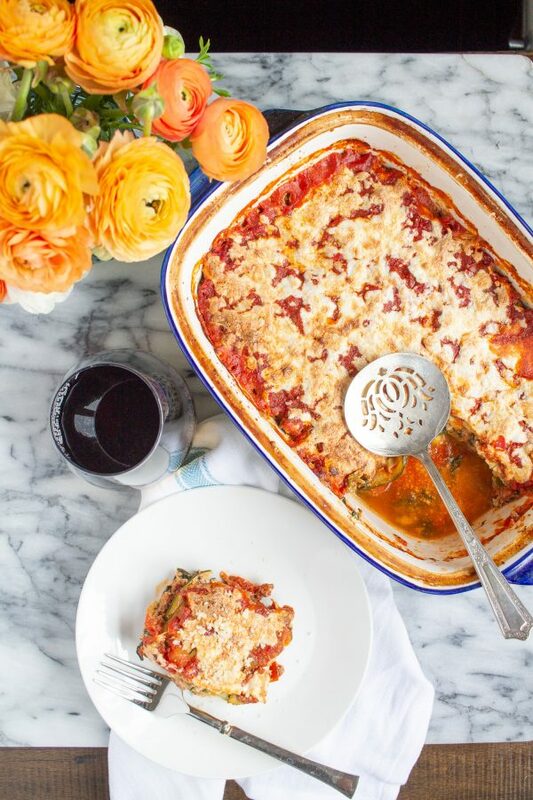 The zucchini will still release more moisture as it cooks in the lasagna, but the excess water will sink to the bottom of the pan as you take out each slice. 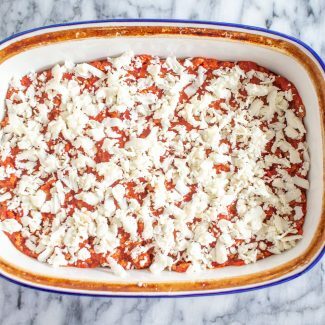 The lasagna itself won’t be soupy, there will just be a little moisture in the bottom of the pan. 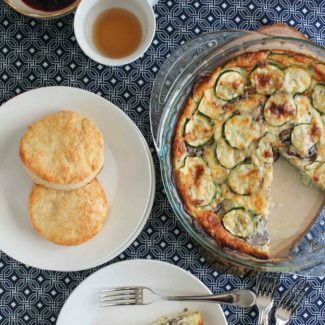 Charles gave this recipe an enthusiastic thumbs up, and said that he particularly loved the combination of the beef and zucchini. 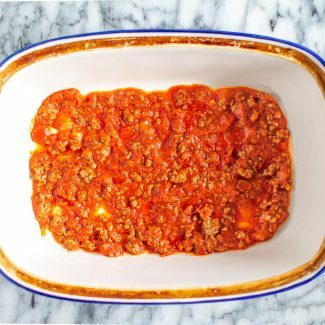 We did agree that this recipe would be a bit bland without the beef, but you could use any meaty sauce you like. 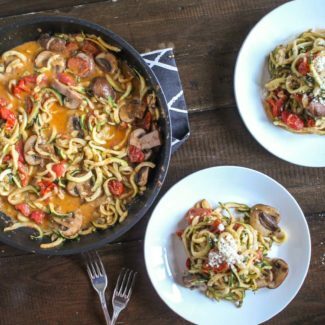 If you want to make a vegetarian version of this recipe you could try adding chunks of mushrooms to the sauce instead of beef. 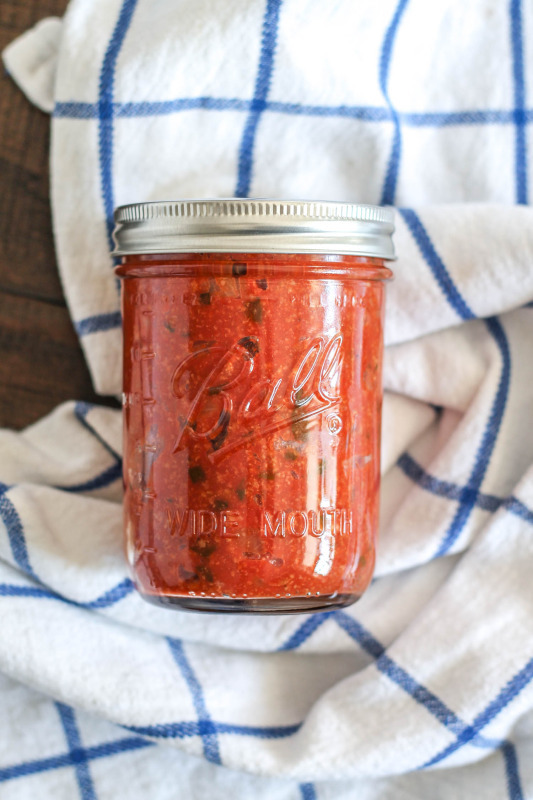 Before we jump the recipe – here is my go-to recipe for bolognese. I used it in this recipe. 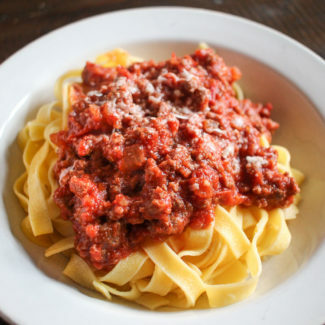 Here is my Great Aunt Diddie’s classic bolognese sauce recipe. 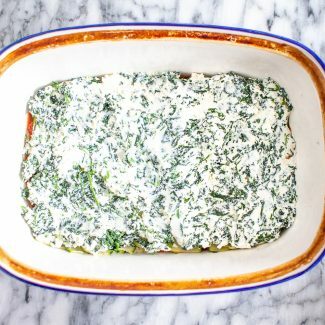 I love this recipe for Zucchini Lasagna because it manages to be meaty while being low-carb. First, use a peeler to create slices of zucchini. I experimented with a few different tools, including a mandoline, and found that a peeler worked best. You want the slices to be as thin as possible. Lay the slices of zucchini out on paper towels in a single layer, and blot them with another paper towel to soak up some of the extra moisture. 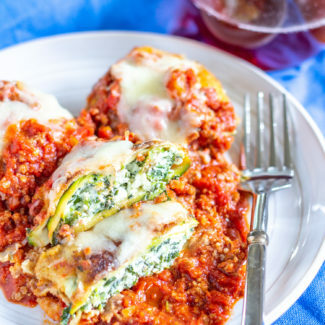 Leave the slices of zucchini out to dry out a little while you prepare the bolognese sauce. Next prepare the bolognese sauce. Melt the butter in a medium sized pot. Once the butter has melted, run the garlic cloves through a garlic press and stir them into the butter. After a minute, add the ground beef, season with salt and pepper, and use a wooden spoon to break the beef up into small pieces. Stir frequently until the beef has browned. 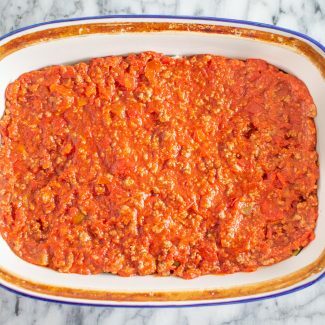 Pour the crushed tomatoes and tomato paste over the beef, and season with salt and pepper. Bring to a slow and steady boil and let the sauce reduce for 10 minutes. Thaw the frozen spinach (I placed it in a fine mesh strainer and ran it under hot water) and squeeze out the excess water. 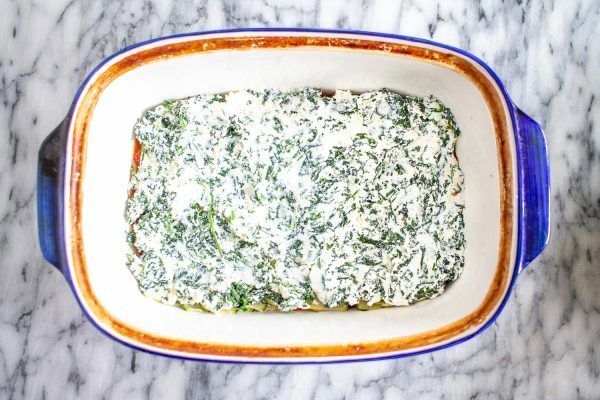 Then stir the spinach and ricotta together. 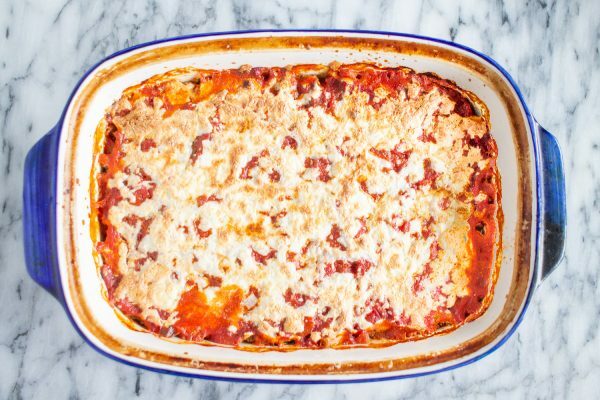 To assemble the lasagna, start by pouring a thin layer of the bolognese sauce on the bottom of a casserole dish. Then add zucchini on top. You want a nice thick layer of zucchini, I made the layer double thick. Next add 1/2 of the ricotta and spinach mixture and spread it over the zucchini in an even layer. Then add another layer of zucchini on top. Pour half of the remaining bolognese over the zucchini. 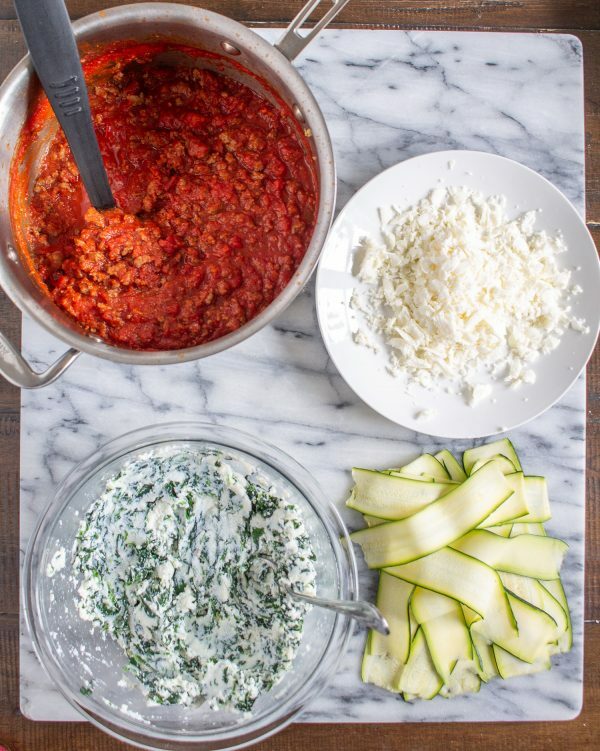 Repeat the last steps, creating layers of zucchini, ricotta, and zucchini. Pour the remaining sauce over the top, and sprinkle the mozzarella over. 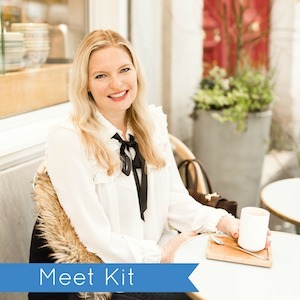 Bake for 30 minutes at 350 degrees, and serve immediately. I experimented with a few different tools, including a mandoline, and found that a peeler worked best. You want the slices to be as thin as possible. I used paper towels to blot the slices of zucchini and soak up excess moisture. 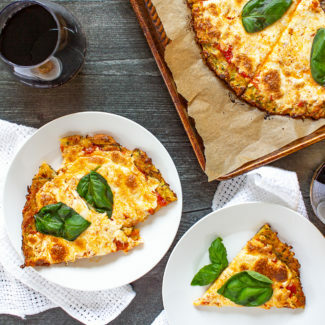 You can also opt to quickly pre-bake the slices of zucchini. Do so by laying them out on parchment paper in a single layer, baking for 5 minutes at 350 degrees, and then blotting any excess moisture with paper towels.